Another word for father is worry. Worry boils the water for tea in the middle of the night. Worry trimmed the child's nails before singing him to sleep. Another word for son is delight, another word, hidden. And another is One-Who-Goes-Away. Yet another, One-Who-Returns. So many words for son: He-Dreams-for-All-Our-Sakes. His-Play-Vouchsafes-Our-Winter-Share. His-Dispersal-Wins-the-Birds. 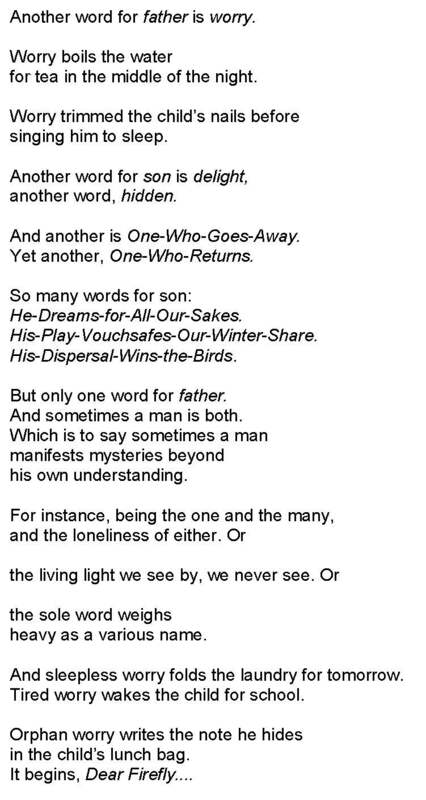 But only one word for father. And sometimes a man is both. Which is to say sometimes a man manifests mysteries beyond his own understanding. For instance, being the one and the many, and the loneliness of either. Or the living light we see by, we never see. Or the sole word weighs heavy as a various name. And sleepless worry folds the laundry for tomorrow. Tired worry wakes the child for school. Orphan worry writes the note he hides in the child's lunch bag. It begins, Dear Firefly…. by Li-Young Lee. Used with the permission of The Permissions Company, Inc. on behalf of BOA Editions Inc., www.boaeditions.org.